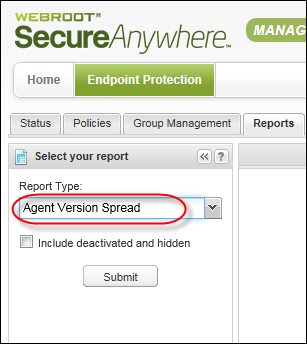 To locate endpoints with different SecureAnywhere versions installed, you can generate the Agent Version Spread report. 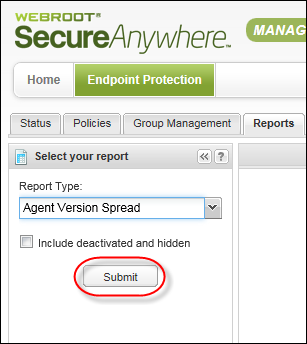 An agent is the SecureAnywhere software running on the endpoint. You can use this report to locate endpoints that should be upgraded. 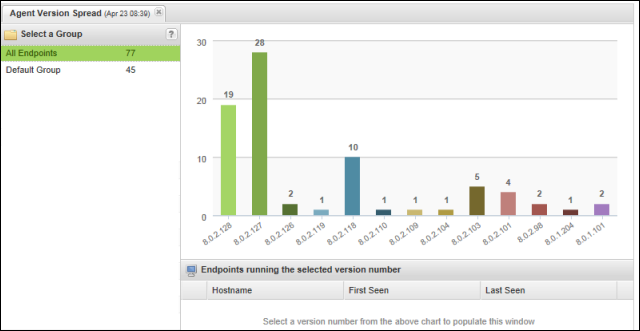 The report displays a bar chart showing the version numbers in your network and the endpoints using each version. View all versions within a selected group, which is helpful if you need to narrow search results to a specific set of endpoints. Drill down to see the endpoints using a specific version, which is helpful if you want to determine which endpoints should be upgraded. Note: You can quickly glance at the Status tab to see a pie chart of the agent version spread. For more information, see Viewing an Agent Version Overview. From the Report Type drop-down menu, select Agent Version Spread. 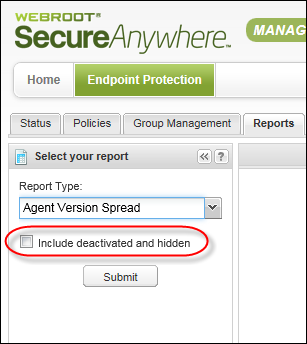 To include deactivated and hidden endpoints in the report, select the Include deactivated and hidden checkbox. A list of groups opens along with the Agent Version Spread report. To view data for a specific group, click the group name on the left. The bar chart redisplays the data with only the selected group. 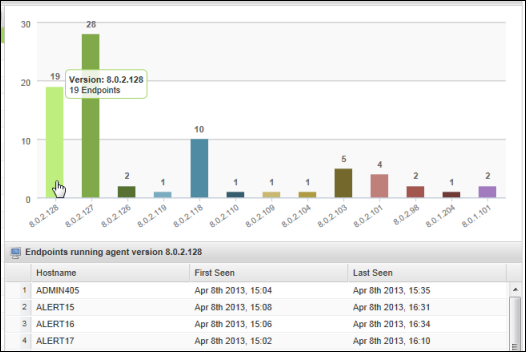 To view the endpoints using the version, click a bar to see details. The bottom panel displays data about each endpoint. To show or hide additional data for the report, click a column header to display the drop-down menu, then select checkboxes to select, add, or remove columns. For more information about the data in the columns, see Sorting Data in Tables and Reports.